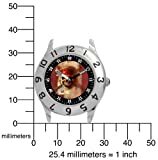 With its clear markings and labeled watch hands, the Disney Kids’ Pirates of the Caribbean Black Velcro Watch #D009S500 makes it easy for your “Pirates” fan to tell time. 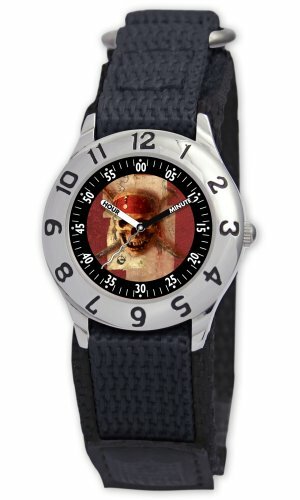 The skull and crossbones logo from the “Pirates of the Caribbean” movie is showcased on the dial. 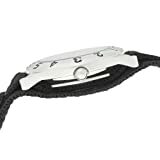 Several design elements make it as easy as possible for your child to tell the time : the polished metal bezel shows the hours in big, bold Arabic numerals; minutes are marked separately in white on a black ring encircling the dial; and the hands are clearly marked “hour” and “minute. 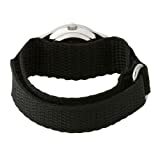 ” Kids will love the watch’s sporty, almost grown-up look, which features metal accents and a black nylon strap that easily fastens with a Velcro closure. This watch is water resistant to 99 feet and is powered by analog quartz movement.